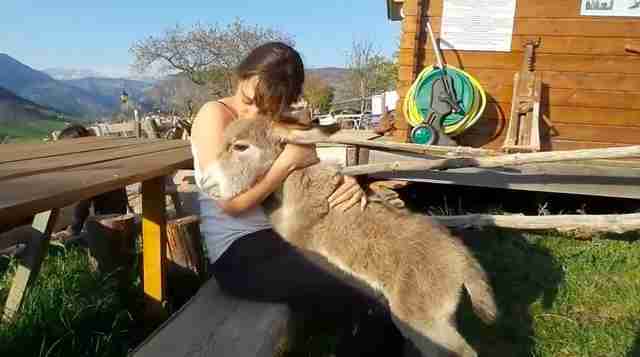 When a young donkey met one particular visitor at her farm, she jumped up and wagged her tail just like a dog would. A video shared on Facebook captured the moment Echalote the donkey met the young woman, who likely wasn't expecting the donkey to be so affectionate. The woman laughs as Echalote nuzzles her arm the same way that dogs use their snouts to get their humans' attention. 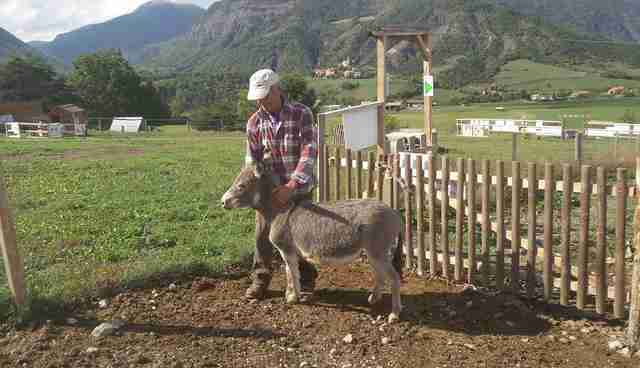 The older donkey at the end of the video is Echalote's mother, Anisette. Both live together at the Bel'âne Farm in southern France, where people occasionally visit and play with the animals. Though Echalote seems to have taken a liking to this particular woman, Bel'âne told the Dodo that "Echalote is a little donkey who's cuddly with ALL the visitors." Maybe one of the reasons Echalote is always in good spirits is that she lives in one of the most scenic locations on Earth. Since Echalote and Anisette live in the French Alps, they spend every day in the middle of beautifully green mountains, as seen in the photo below. The video goes to show that donkeys may have hooves instead of paws, but when it comes to being pet and rubbed all over, they can be just as appreciative as our canine companions.